These words are sprinkled haphazardly in our modern fashion lexicon; descriptive ingredients in an already over-spiced stew of collections that likely derived from an era that exemplified these words more aptly, that wore them with more aplomb. The 1930s was a time of change and transformation – financial, political and technological. 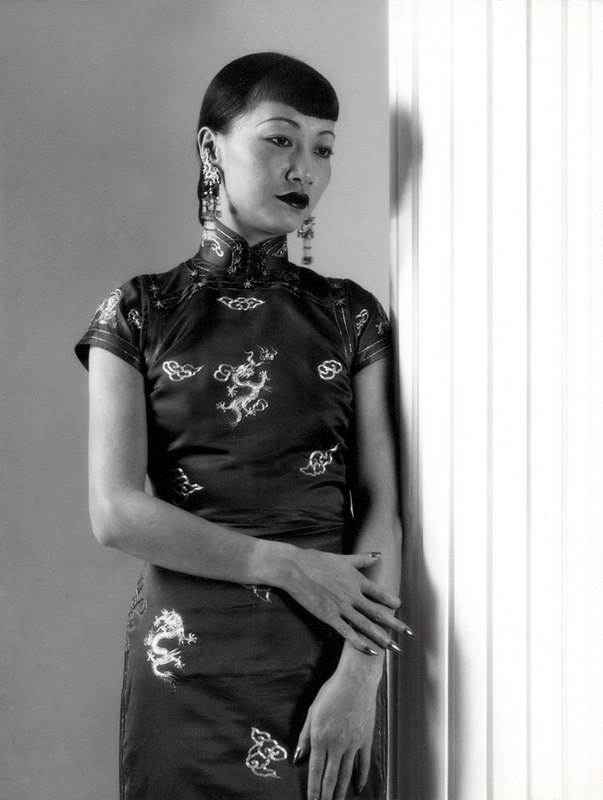 It was also a time of softer silhouettes, shifting proportions and less ornamentation in fashion. It was truly a time of quiet glamour, of grace, and of elegance. Dorvyne Mlle Boecler in a green tulle gown, Spring 1934. 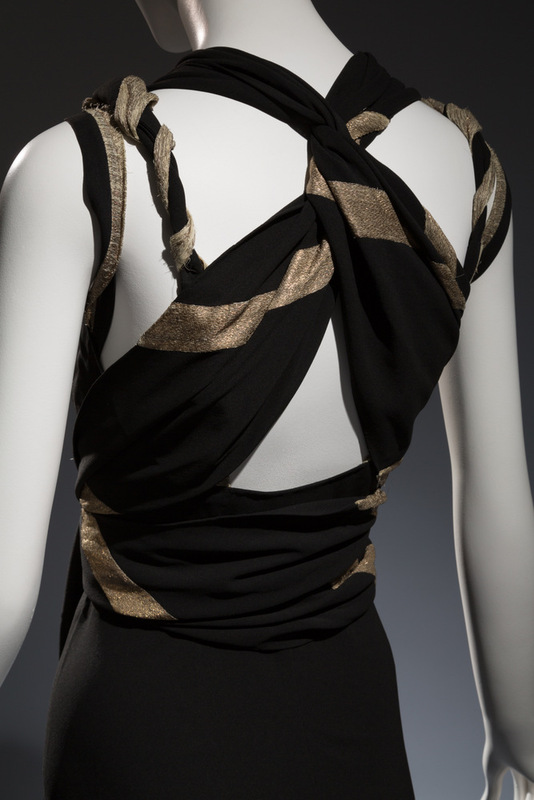 The dramatic back drape of an Augustabernard crepe gown, 1933, France. 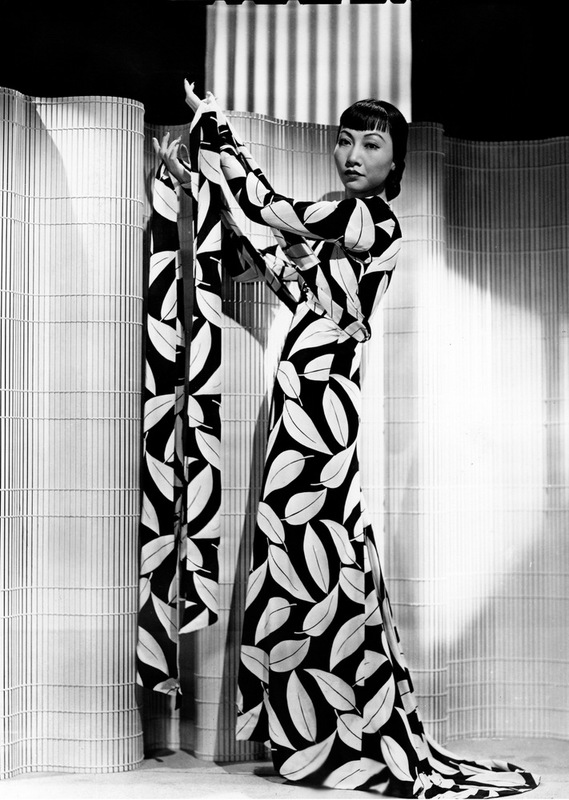 Valentina rayon crepe dress, circa 1940, USA. 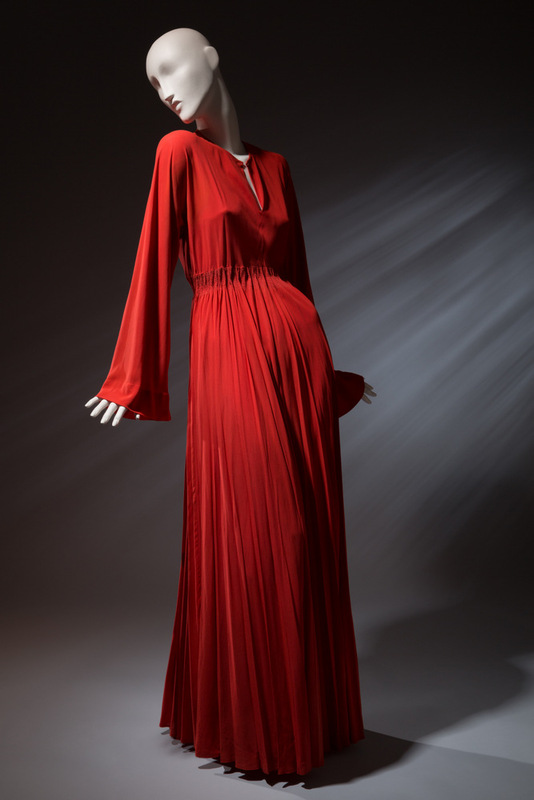 How very Valentino red gown, too. 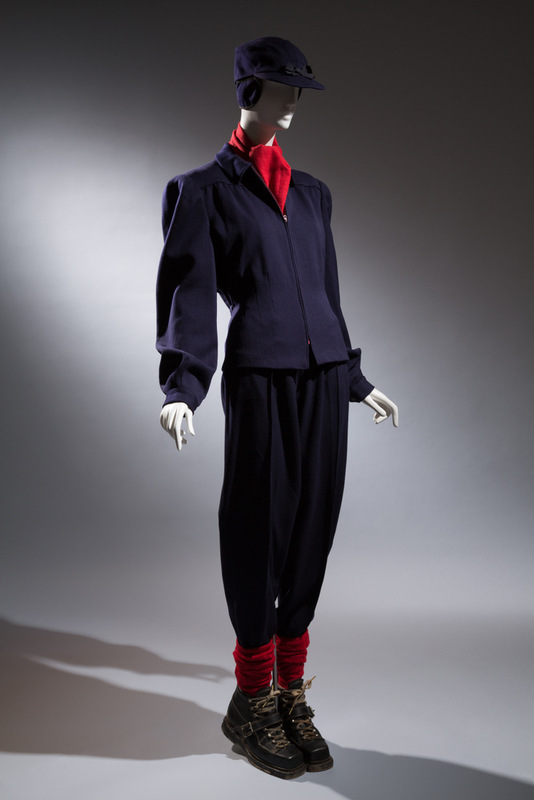 Elegance in an Age of Crisis: Fashion of the 1930s, one of the current exhibitions at the Museum at FIT in New York City, celebrates the decade’s innovations in fashion, highlighting both men’s and women’s clothing from couture to custom-tailoring, avec accoutrements. 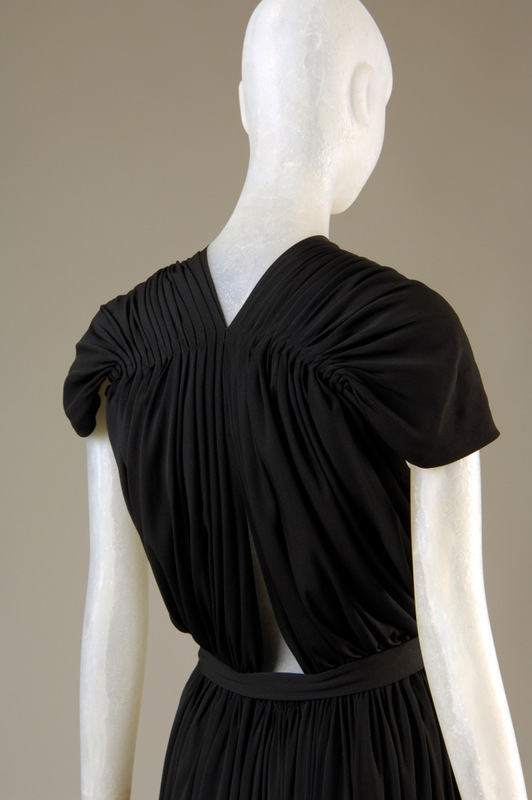 Madeleine Vionnet black crepe lame gown, circa 1937. 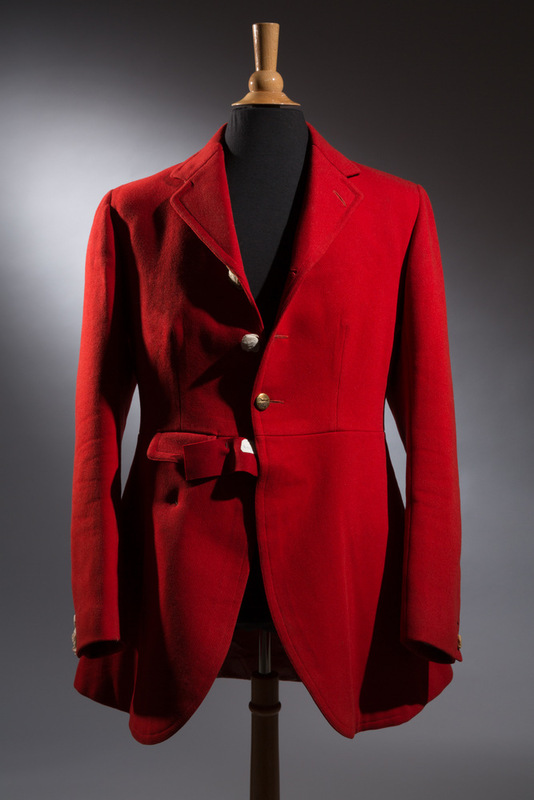 Huntsman red wool riding coat, 1937. During this period, designers had new methodologies and textiles at their fingertips for the first time. We take so much for granted now in the era of digital prints and computerized textile production, but things like wider looms for woven fabrics and larger vats for dyeing materials altered the way clothing creators thought about and ultimately made their garments. 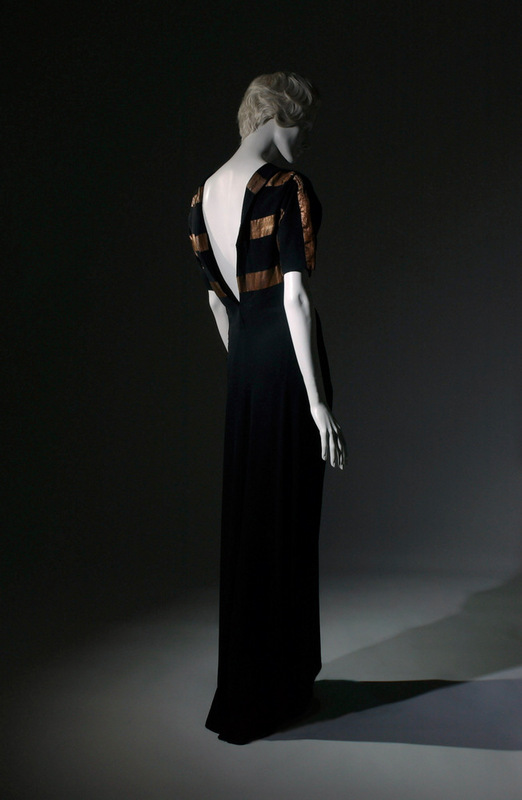 Claire McCardell evening dress, circa 1939, USA. What’s so amazing to me is how modern these pieces still look. There was a deconstruction in the way suits were cut, for example, or how a dress was to drape. Designer ideas weren’t weighed down by the heavy fabrics of the Edwardians, and those voluminous 1920s shapes could suddenly be contained. Designers could step outside of that boxy silhouette. 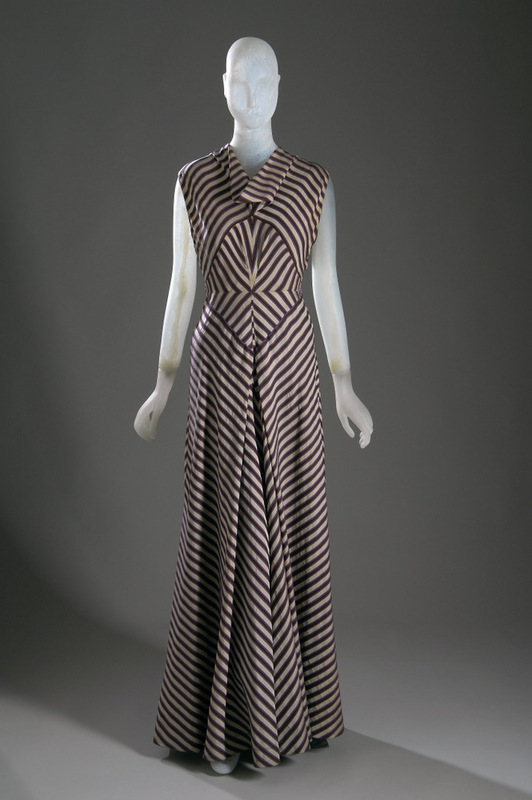 Hawes striped silk and rayon evening dress, circa 1936, USA. 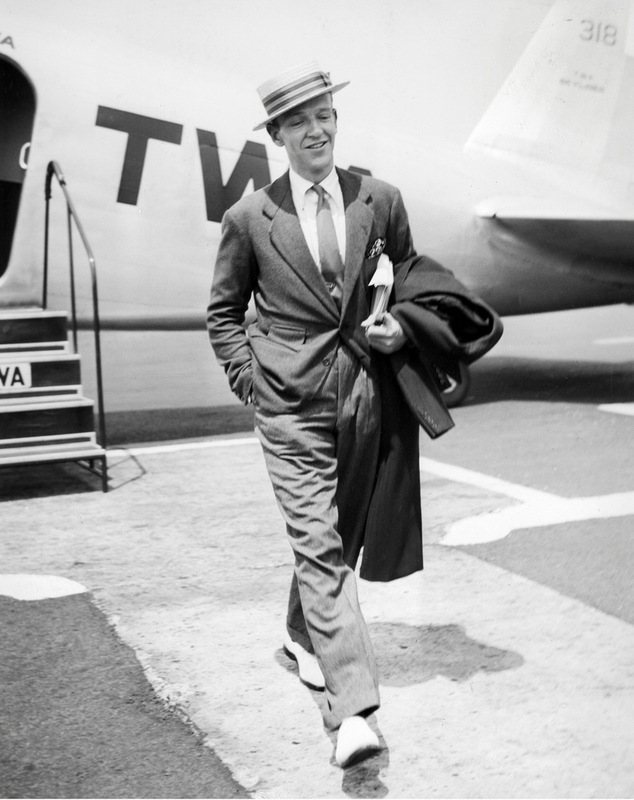 One could say this was the era that leaned in first – clothing fit well, but was also unrestrictive and offered movement. The Victorians had shape but didn’t dare breathe in their corsets and collars. 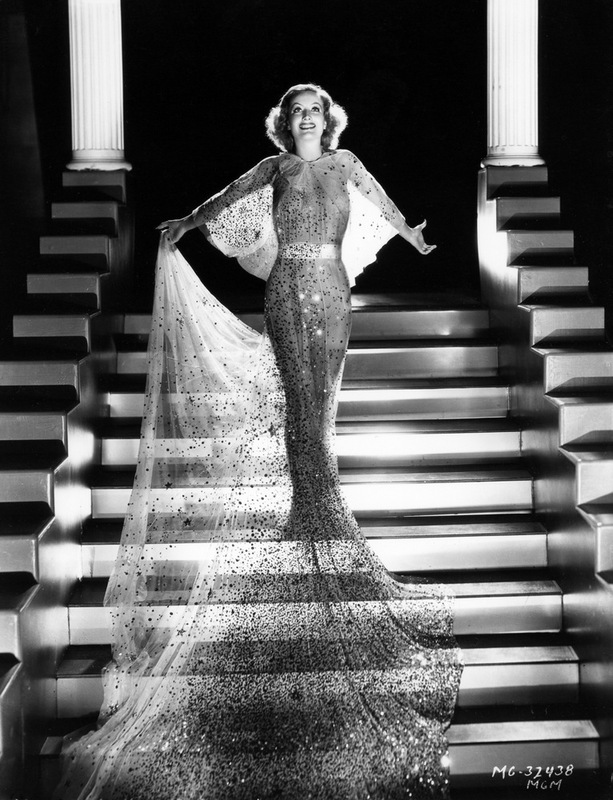 The flappers were floaty, to be sure, but the fit wasn’t always flattering. 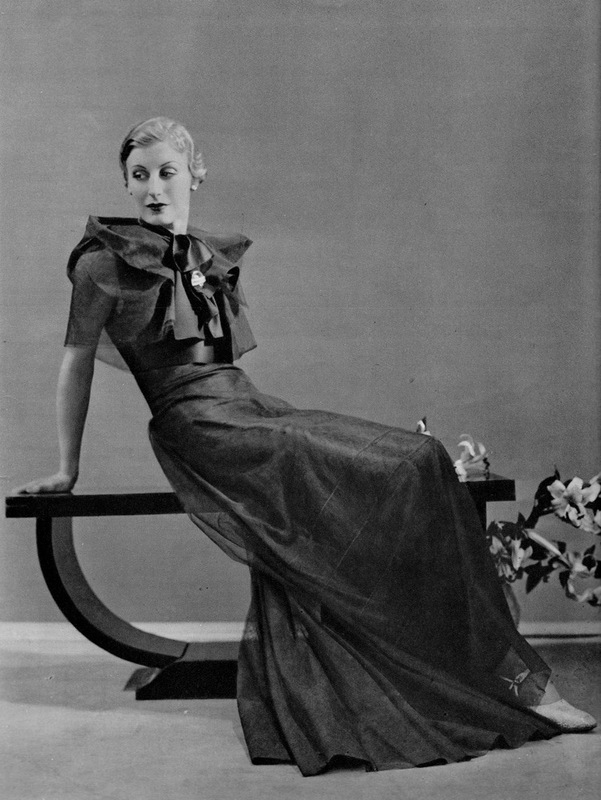 The ’30s offered both fit and function in proportion. 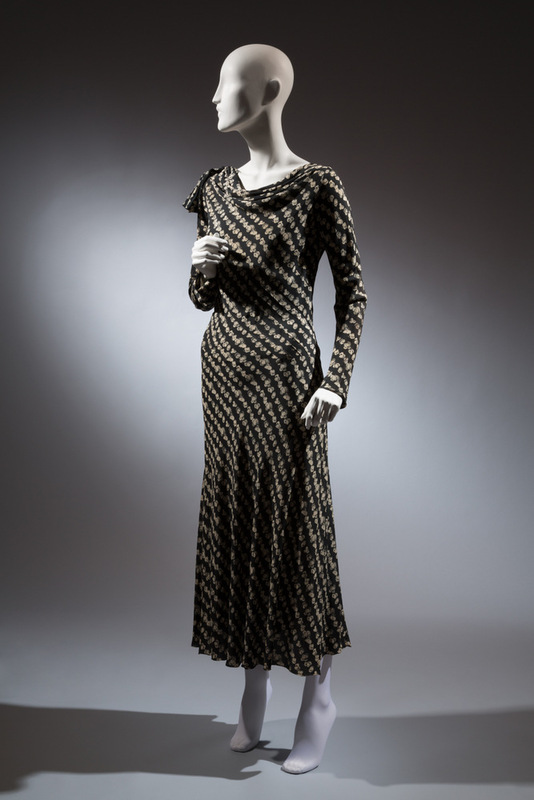 Augustabernard black-and-white printed silk gown, 1929, France. I may be biased but I want to wear this right now. It’s no surprise that this new classicism was a hit the world over. 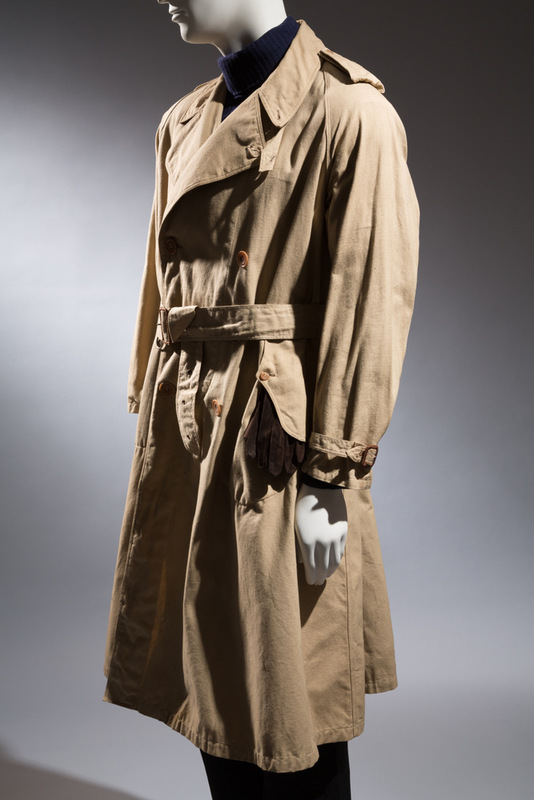 The exhibition includes 80 ensembles and 30 accessories, showcasing tailoring from London, couture from Paris as well as global glamour from Havana, Hollywood, Shanghai and Europe. 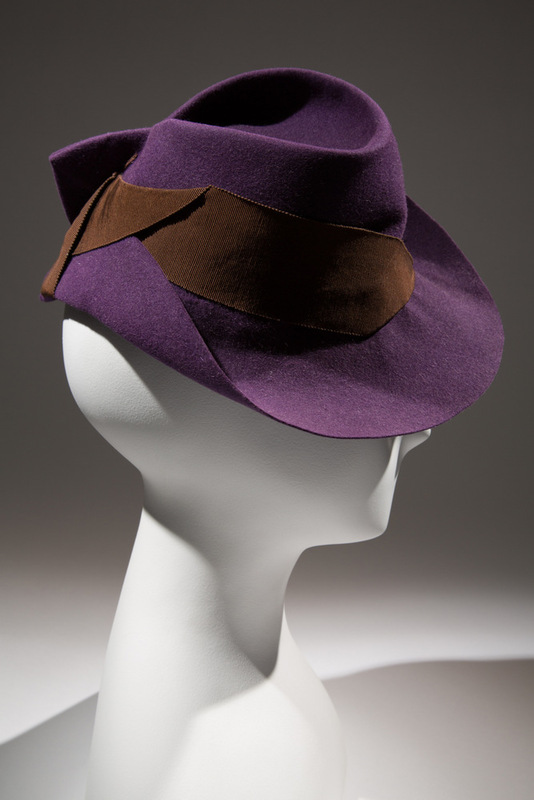 Purple felt hat with brown grosgrain ribbon, circa 1935, USA. 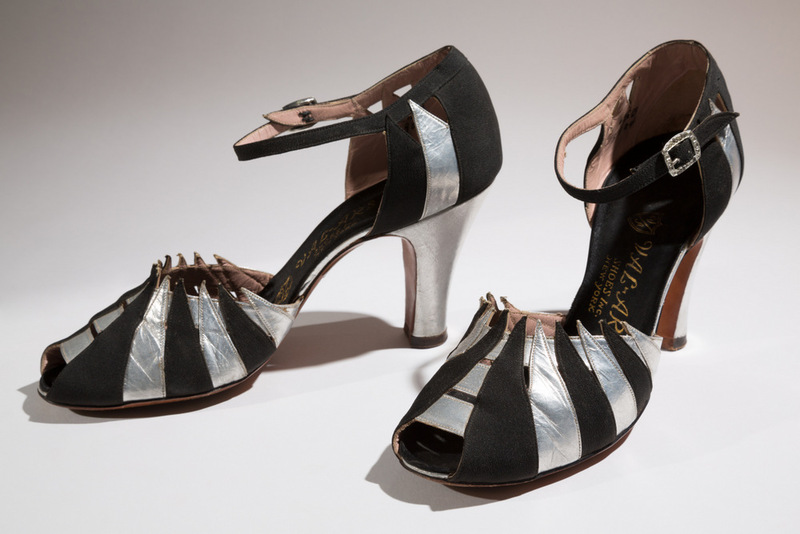 Val-Ars evening sandals, circa 1935, USA. The fashion folk at MFIT always tell great stories through their exhibitions, and this show seems to follow that pattern. Divided into four sections, it showcases: active and resort wear; developments in men’s tailoring and women’s couture focused mainly on daywear; formal wear including examples from Vionnet and Balenciaga organized by trend; and the final section includes a couple of very special luxury garments for both men and women – think lush velvet and infinitely pleated silk chiffon before Issey Miyake made you look. Woman’s ski ensemble, circa 1935, USA. The lining of that ski jacket. 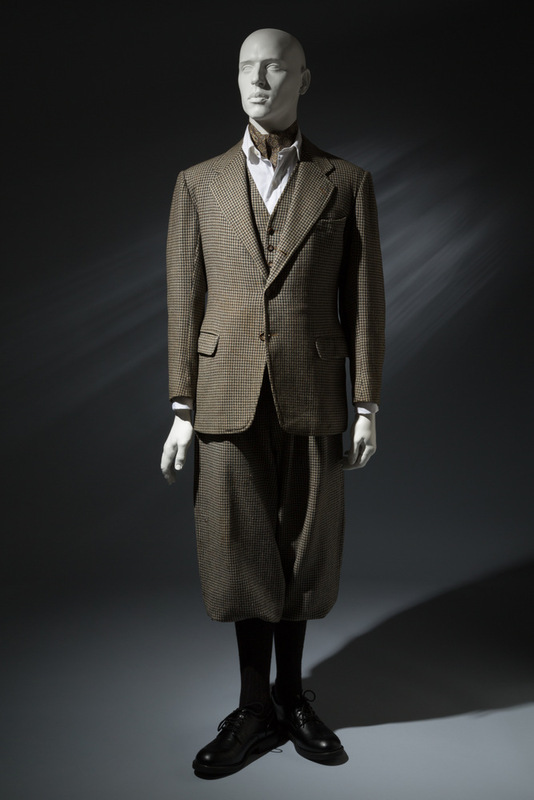 Man’s 3-piece walking suit by Anderson & Sheppard, 1935. 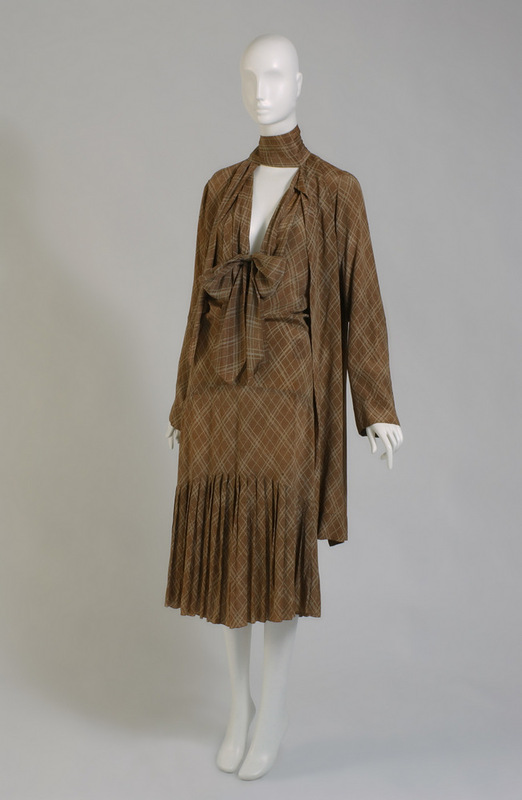 Louiseboulanger dress and jacket, printed crepe, 1929. 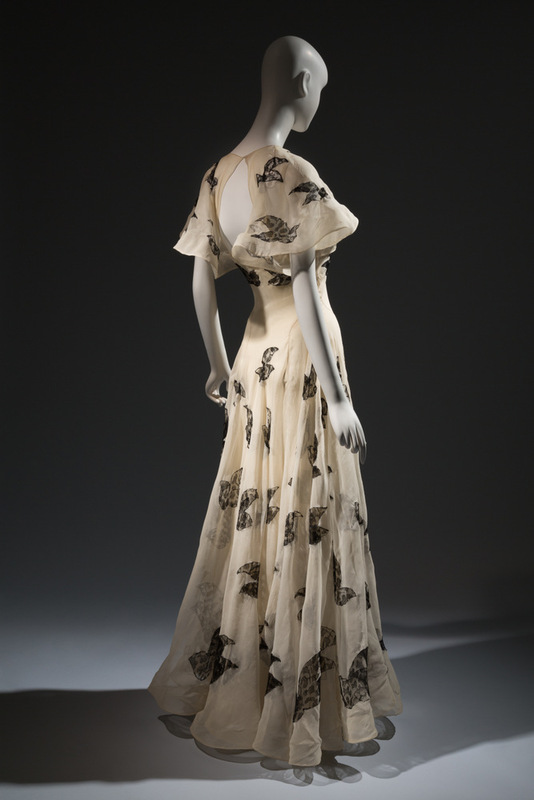 Madeleine Vionnet silk organza gown with black lace insets, 1937. 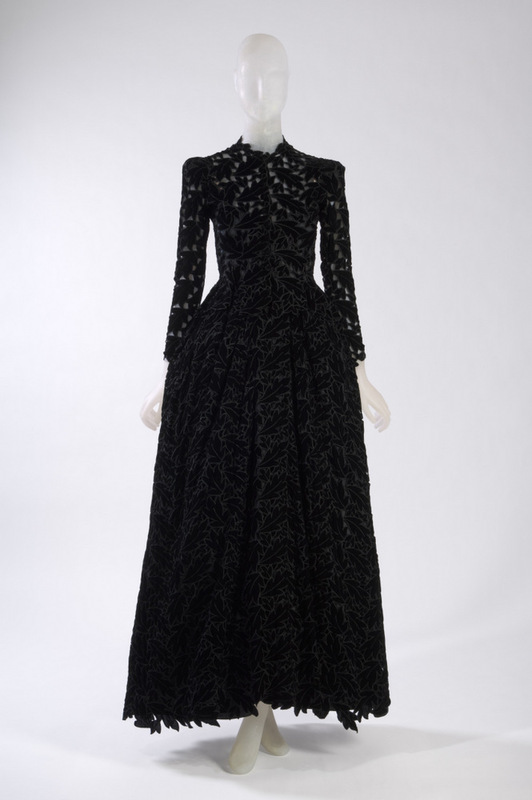 Cristobal Balenciaga black velvet cutwork gown, 1938, France. 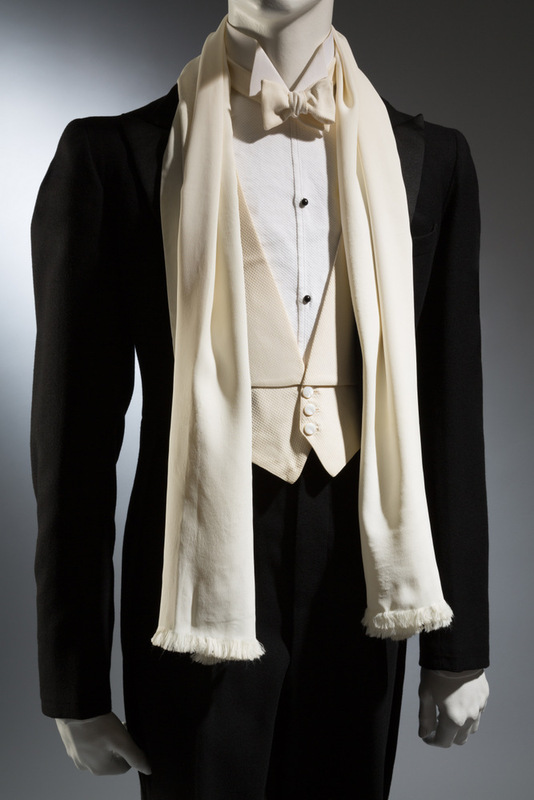 Wood Carlson Co. black wool tailcoat, 1935, USA. 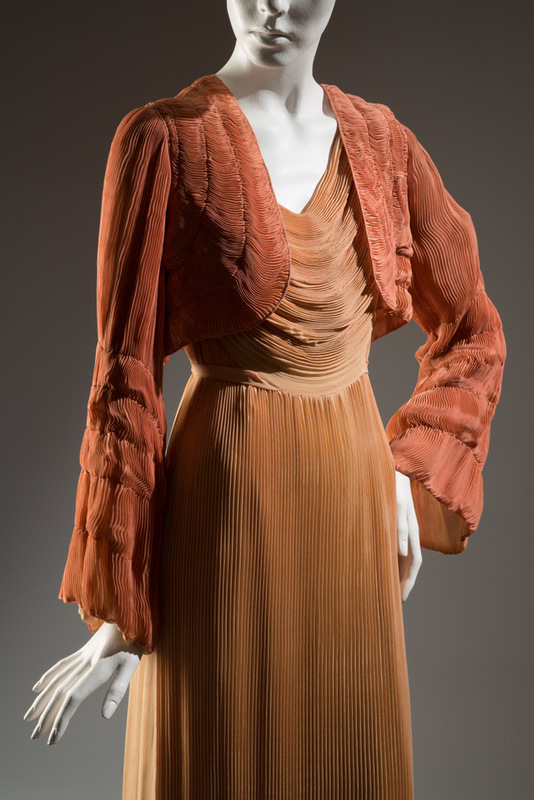 Hélène Yrande coral and peach pleated silk chiffon ensemble, 1932, France. 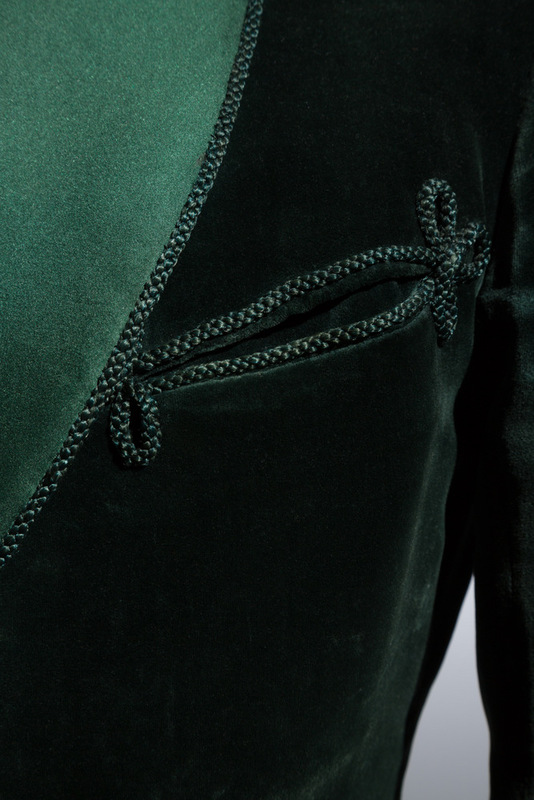 Bottle green cotton velvet smoking jacket, 1936. 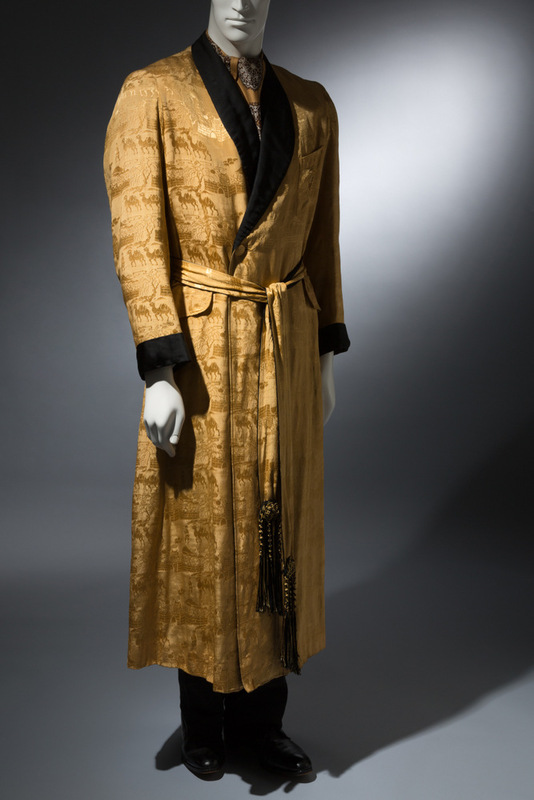 Charvet silk brocade dressing gown, circa 1930, France. The exhibition (which started in February) runs until April 19th. Sadly, I won’t be able to see this one in person, but there is an accompanying publication and of course, the exhibition website, if you’d like to travel back in fashion time with me. Beyond Rebellion: Fashioning the Biker Jacket, examining high fashion interpretations of the black leather motorcycle jacket, just wrapped up this past weekend at MFIT. There’s an online playground for that one, too. I got lost in the Extras section, which shows image sources from so many musical genres. If you click on The Clash link, you will never come back up for air…I warn you now. 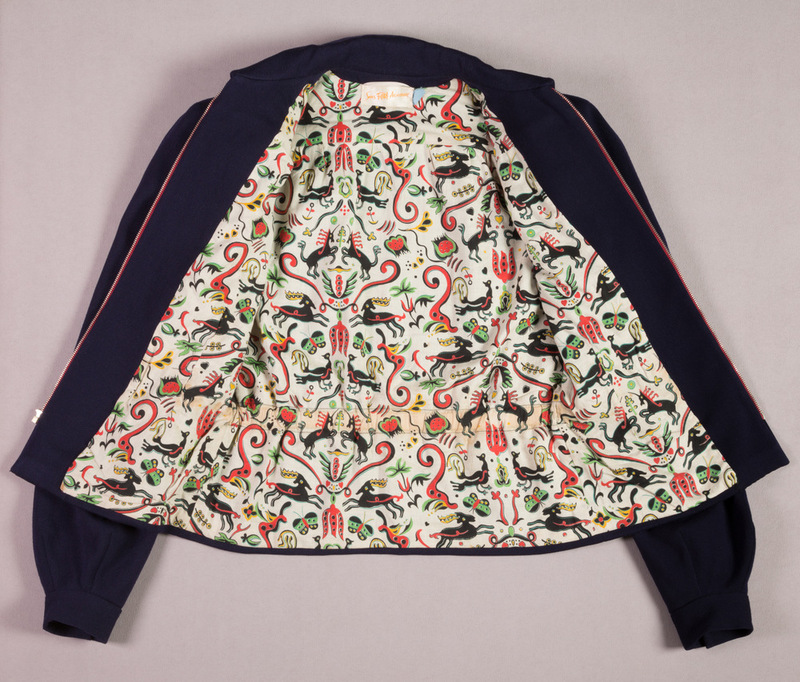 Another exhibition entitled Trend-ology, examines the diverse sources from which fashion trends have emerged over the past 250 years, and runs until the end of the month. A lingerie exhibition is on the way next. The Museum is one of my favourites and a must-stop during every NYC visit – I love the constantly rotating exhibitions (there are at least two running each time I visit). Photofest film still. All images courtesy of MFIT, as noted.